We’re sorry for the delay in getting May’s monthly e-newsletter to you! Due to the holiday and a medical issue with a colleague, we’re a bit behind. Please enjoy! Hard cider lovers asked, Ciderboys listened, and now two popular Ciderboys flavors, First Press traditional hard cider and summer seasonal Peach County, are available in 16-ounce cans just in time for summer. Introduced at retail this month wherever Ciderboys carbonated, gluten-free hard ciders are sold, First Press and Peach County 16-ounce cans are available in four packs and as single-serve cans. Aluminum can packages continue to grow in popularity for hard ciders, according to Julie Birrenkott, Ciderboys Marketing Manager. The new 16-ounce cans for First Press and Peach County fill the demand from cider lovers who prefer drinking their favorite beverages in pints. They also offer attractive single-serve packages for the important U.S. convenience store market, Birrenkott said. “Single-serve 16-ounce cans are perfect for placement in cooler door racks in the c-store trade, where they promote sampling and trial by consumers,” she said. First Press and Ciderboys’ other year-round flavor, Strawberry Magic, are packaged in 12-ounce cans and continue to grow in many benefits: they are conveniently portable, become cold faster, provide 100% product protection from oxygen and sunlight, don’t break and are 100% recyclable. “Cans often can go where glass bottles cannot; they’re perfect for the beach, the boat, or the campground, for example,” Birrenkott said. First Press and Peach County are world-class award winners: both won gold medals last fall in the 2015 World Cider Championships, First Press in the Common Cider category and Peach County in the Fruit Cider judging. 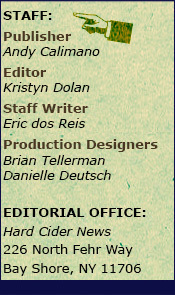 Ciderboys long list of awards just got longer this month when Ciderboys received six gold medals and two silver medals in Tastings.com’s most recent hard cider judging, the most of any cider maker. Peach County, Pineapple Hula, Strawberry Magic, Cranberry Road, Mad Bark and Raspberry Smash all received gold medals with scores ranging from 90-94. First Press and Grand Mimosa received silver medals. 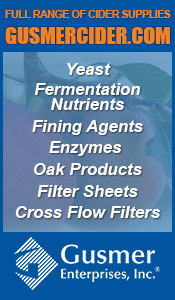 For more information and where to find Ciderboys products, visit Ciderboys.com. Photos courtesy of Stevens Point Brewery, the parent company of Ciderboys Cider Co.
Recovering from "Lemmy" Kilmister’s recent passing and Philip “Philthy Animal” John Taylor’s passing the month before, Motorhead is trucking on and their newest project isn’t music based at all. Ian Fraser "Lemmy" Kilmister, the iconic head of the british rock band famous for the song “Ace of Spades”, among others, passed in December after he lost his short battle with an extremely aggressive cancer. To tribute him and the band, the group released Snaggletooth Hard Cider. The whole project took the band around 12 months to finally become the final product that was released on May 16, 2016, just weeks before the release of their upcoming live album on June 10th. Snaggletooth hard cider is named after the Motorhead mascot and the band felt it was fitting as the label art to the bottle. Snaggletooth is a 5.5% ABV cider. It is described as a dry British cider that is comprised of Dabinet, Michelin, and a wide variety of other dessert apples. This blend of juices come together to create a well balanced, mildly sweet, crisp cider. Snaggletooth pours a clear golden color with a thin white head and a medium mouthfeel. It has a sweet apple scent to the nose. This cider is quite tannic with slight sourness to it and is lightly carbonated. Snaggletooth is a gluten free cider and can be purchased in six packs of 500ML bottles for around $22. The cider is produced by Aston Manor, a Birmingham, England based cider manufacturer. The band is no stranger to Motorhead branded alcoholic beverages. They have already come out with band branded beer, wine, whiskey, and vodka. It is said that Lemy became interested in beer, wine, and cider after finding out he was diabetic. He began finding alternatives after doctors made him cut down on his iconic drink of choice the "Jack and Coke". If you’re a cider fan, a Motorhead fan, or you just want to party like a rock star, Snaggletooth Hard Cider is a definite addition to the list. You can check out more about all of the Motorhead beverages here. Photos courtesy of Brands for Bands. Partners Mattie Beason and John Eisensmith celebrated the opening of Black Twig Cider House, a cider-focused restaurant featuring the largest variety of cider in the Southeast and the only restaurant in the United States to feature a txotx. Named after an early 19th century southern cider apple, Black Twig offers over eighty ciders on draft and bottle, making it the first cider house of its kind in the Southeast and one of ten cider-focused restaurants in the country. Black Twig is located at 2812 Erwin Road, Durham, NC. Beason discovered his passion for cider while traveling through Spain’s Basque region ten years ago. “As soon as I experienced their incredible ciders, the rituals, and the communal aspect around the txotx, I knew I wanted to make it part of the Durham community.” As a nod to the traditional Basque cider houses and to create the communal feel inherent in a cider house, Black Twig features a traditional txotx – a Spanish cider barrel – where patrons gather around the cider barrel to sample the featured cider in two to four ounce pours. 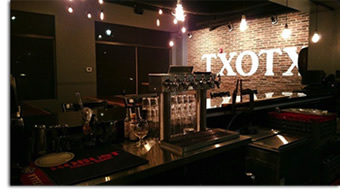 Black Twig’s txotx is a traditional nod to the unique aspect of cider culture camaraderie. 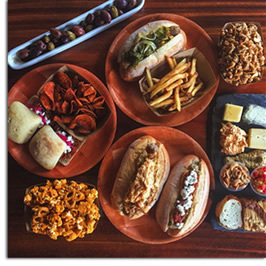 Eisensmith will oversee the kitchen at Black Twig, serving elevated bar fare and locally-sourced Firsthand Foods’ sausages with Gulglhupf buns and housemade condiments. 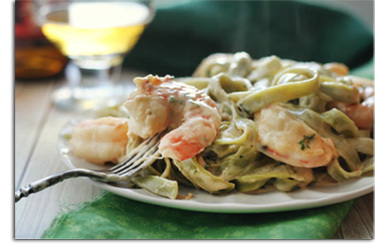 The natural fattiness of the food is a perfect pairing with cider. Black Twig is open Monday-Saturday from 11am to 10pm. 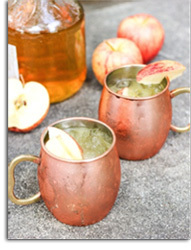 Visit BlackTwigCiderHouse.com for additional information and menus. Photos courtesy of Black Twig Cider House. The Virginia Cooperative Extension is preparing for a field day on Thursday, June 16, 2016 from 9:00am-3:30pm at the Alson H. Smith Jr. Agricultural Research and Extension Center located in Winchester, Virginia. The focus of the field day is to showcase current research projects geared towards cider apple production and fermentation. Participants will learn about cider fermentation and yeast assimilable nitrogen (YAN) as well as the impacts of harvest maturity and postharvest storage on cider quality. The workshop will also include a visit to a variety trial orchard block, a sensory faults demonstration, and regional cider evaluations. 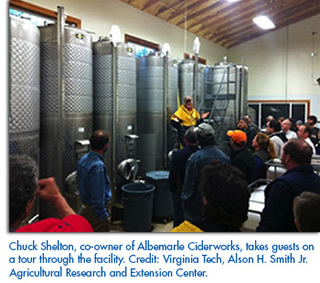 There will also be a networking lunch and a concluding discussion to assess the future directions of the Virginia cider industry. The Commercial Cider Production Workshop is open to both beginning and established commercial cider makers for $20 per person. The registration fee is due by June 10. Attendance is limited to the first 48 registrants. Speakers include Dr. Amanda Stewart, Dr. Greg Peck, Tom Boudreau and Brianna Ewing. The event is rain or shine and will require some outside walking. If you are interested in participating or would like additional information, contact Mark.Sutphin@vt.edu via email or call 540-665-5699. Make sure to mark your calendars with these upcoming cider events taking place next month. Don’t delay in getting your tickets today, if needed. Hudson Valley, New York – Enjoy Cider Week Hudson Valley with events throughout the whole week from pairings to cookouts to dinners and classes all featuring New York cider producers and events in the Hudson Valley of New York. Brooklyn, New York – Pour The Core: Brooklyn will be taking place with 40+ cider producers and over 75+ cider styles in two sessions (session 1 from 12pm-3:30pm and session 2 from 5pm-8:30pm). General admission includes 2-ounce samples from participating cider brands and free seminars on the making and enjoyment of hard cider. Ticketholders will have the chance to purchase select ciders. Use the promo code HCN to get general admission tickets for 50% off! Oregon – The Northwest Cider Association will be hosting its fifth annual Oregon Cider Week, a 10-day celebration inviting everyone from cider makers to chefs to showcase Northwest cider in a variety of special events, featured menus, happy hours, tap takeovers and more! 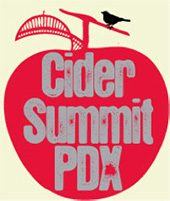 Portland, Oregon – The 6th Annual Cider Summit Portland is the region’s largest cider festival, featuring over 150 ciders including regional favorites and international classics. The event is held once each day and has additional features such as expanded food offerings from World Foods, Bushwacker Cider, Streetcar Bistro, KRAVE Jerky and more. The Oregon Fruit Products Fruit Cider Challenge will also be taking place. 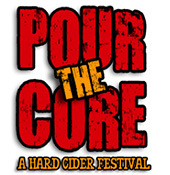 Biglerville, PA – PA Cider Festival will be taking place at Hauser Estate, home of Jack’s Hard Cider, where you can enjoy sampling of Pennsylvania-made cider, cider and apple workshops and seminars, live music by Schizophonic and an artisan market. “The hard cider industry has seen incredible growth over the past several years, and drinkers are embracing it as a refreshing alternative to beer or wine. As drinkers continue to rediscover the American cider tradition, they are interested in trying ciders with more complexity. We think our new Crisp & Dry cider fits that need perfectly,” says Sal Leone, President of Fish Brewing Co. The Crisp & Dry Apple Cider is a semi-dry crisp cider with hints of green apples and acidic tartness, with a refreshing soft sparkling finish. This cider comes in at 5% ABV and is the perfect drink to pair with crème brulee and fresh berries or a smooth brie cheese. 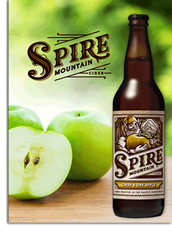 Crisp & Dry Apple Cider will be available year-round to all of Spire Mountain’s distributor partners in 6-pack bottles, 1/6 bbl. and 1/2 bbl. kegs, and 16-ounce cans this coming summer. Spire Mountain’s year round and seasonal offerings highlight the natural flavors of Washington apples. Naturally gluten-free and made from 100 percent locally-sourced, fresh-pressed Washington apples, Spire Mountain products are handcrafted with real ingredients and never from concentrate. Visit FishBrewing.com for additional information. Spire Mountain Ciders is owned and operated by Fish Brewing Company. Photos courtesy of Fish Brewing Company.